Bola Ige was a Nigerian lawyer and politician. He served as Federal Minister of Justice for Nigeria. President Obasanjo appointed Bola Ige as minister of Mines and Power (1999–2000). He was not able to make significant improvements to service provided by the monopoly National Electric Power Authority (NEPA). He then became Minister of Justice and Attorney General of the Federal Republic of Nigeria (2000–2001). On 23 December 2001, Bola Ige was shot dead at his home in the south-western city of Ibadan. He had been entangled in squabbles within his Alliance for Democracy party in Osun State. assassination of the late Attorney General of the Federation, Chief Bola Ige (SAN), and the slain National Vice-Chairman of the defunct All Nigeria Peoples Party, Marshall Harry. 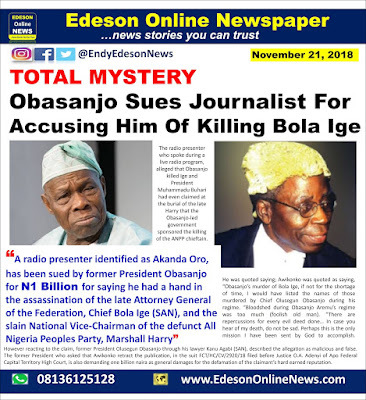 The radio presenter who spoke during a live radio program, alleged that Obasanjo killed Ige and President Muhammadu Buhari had even claimed at the burial of the late Harry that the Obasanjo-led government sponsored the killing of the ANPP chieftain. 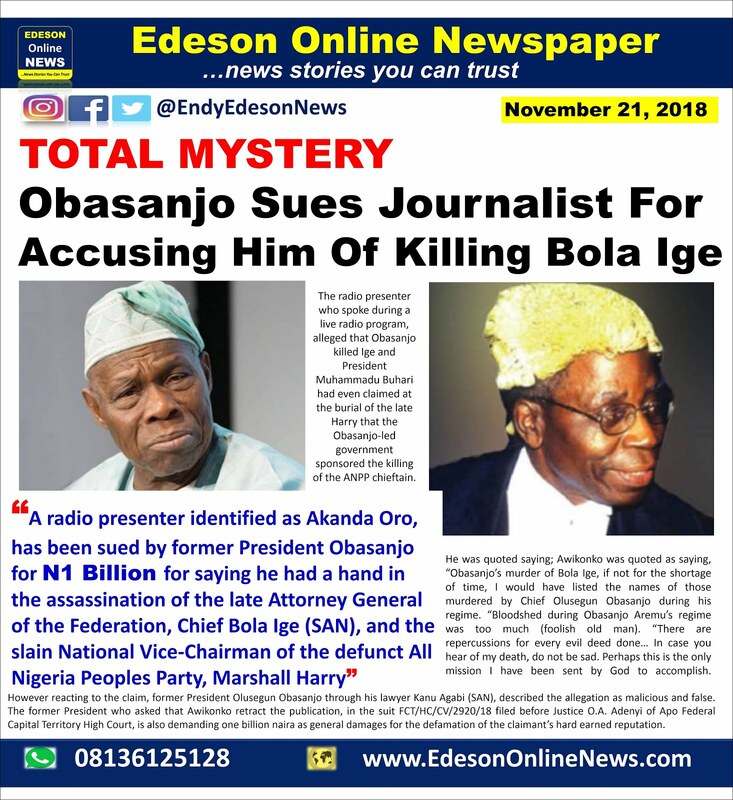 Awikonko was quoted as saying, “Obasanjo’s murder of Bola Ige, if not for the shortage of time, I would have listed the names of those murdered by Chief Olusegun Obasanjo during his regime. “Bloodshed during Obasanjo Aremu’s regime was too much (foolish old man). However reacting to the claim, former President Olusegun Obasanjo through his lawyer Kanu Agabi (SAN), described the allegation as malicious and false. The former President who asked that Awikonko retract the publication, in the suit FCT/HC/CV/2920/18 filed before Justice O.A. Adenyi of Apo Federal Capital Territory High Court, is also demanding one billion naira as general damages for the defamation of the claimant’s hard earned reputation. What if he's actually innocent? THIS IS A VERY CRITICAL ALLEGATIONS. IS JUST SO UNFORTUNATE WE HAVE A FAILED SYSTEM (WHICH WE TRUST GOD TO REVIVE GAIN) IN NIGERIA. IF IT'S ABROAD, THOROUGH INVESTIGATION WILL COMMENCE JUST TO UNMASK THE KILLER AND JUSTICE WILL BE DONE. SINCE OBJ IS INVOLVE, NO BE NEWS TO THEM. PROBABLY, MR JOURNALIST GO AND PACK ONE SIDE. But under obj watch, so bola Ige will die like that and uptill now nobody is responsible.